I'm not loyal to a particular shampoo and conditioner. I usually change it up every few months. 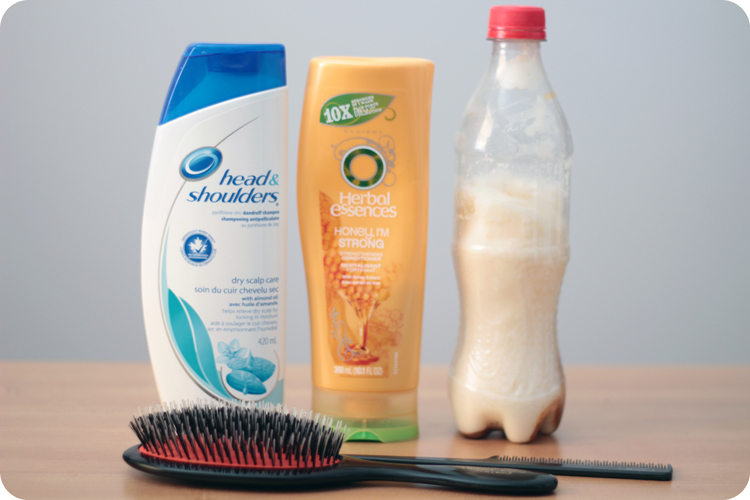 Currently, I'm using the Head & Shoulders Dry Scalp Care shampoo with the Herbal Essences Honey I'm Strong conditioner. I really like this Head & Shoulders shampoo and I often go back to it. It cleans my hair without drying it out. The Herbal Essences conditioner nourishes and strengthens my hair (I've noticed a tad less hair fall). I only wash my hair every other (or third) day, and I find this combination keeps my hair oils at bay. I don't have a hair mask that I'm currently favouring, but I do deep condition my hair once a week. I use coconut oil (see ghetto Coke bottle in the first photo). It's real coconut oil -- no chemicals, silicones, or additives. It makes my hair feel really soft and adds shine while being incredibly nourishing. Other hair treatments I like are the Redken Anti-Snap and the Phyto 9. The Anti-Snap is a serum designed for damaged hair. I use it to fortify my hair against breakage. I also like that it has a heat protectant built into it. Phyto 9 is for "ultra dry hair." I like to pop this cream on to the ends of my hair when it's feeling a little dry or brittle. My hair is quite cooperative. It doesn't take a lot for it to look presentable. 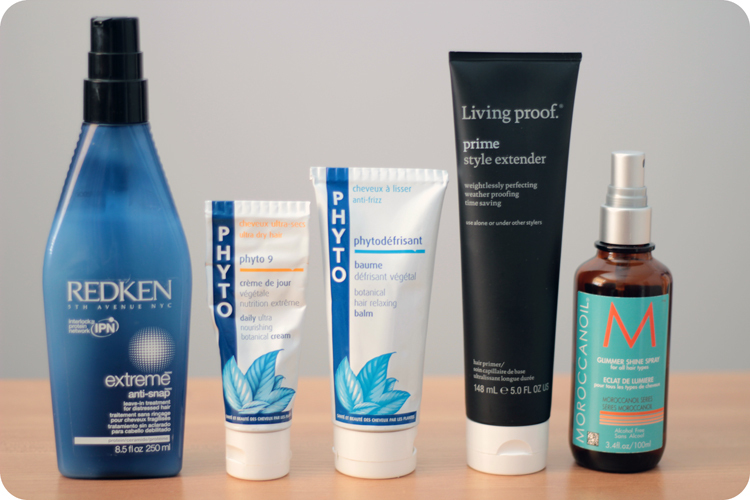 Some "styling" products I use are the Living Proof Prime Style Extender (hair primer), the Phytodéfrisant, and the Moroccanoil Glimmer Shiner Spray. The Living Proof hair primer keeps my hair looking the same until my next wash. It prevents my hair from kinking up while sleeping, too. The Phytodéfrisant is a great anti-frizz serum. It's heat activated, so it works best with a blowout, but it still shows results regardless. My last favourite is the Moroccanoil finishing spray. While it does nothing for the health of your hair, it does add a pretty shine without looking greasy. After shampooing and conditioning, I quickly towel dry my hair. I try not to keep my hair wrapped in the towel for too long because I find it promotes frizz. Before I add any hair products, I use a wide-toothed comb to get rid of any knots. 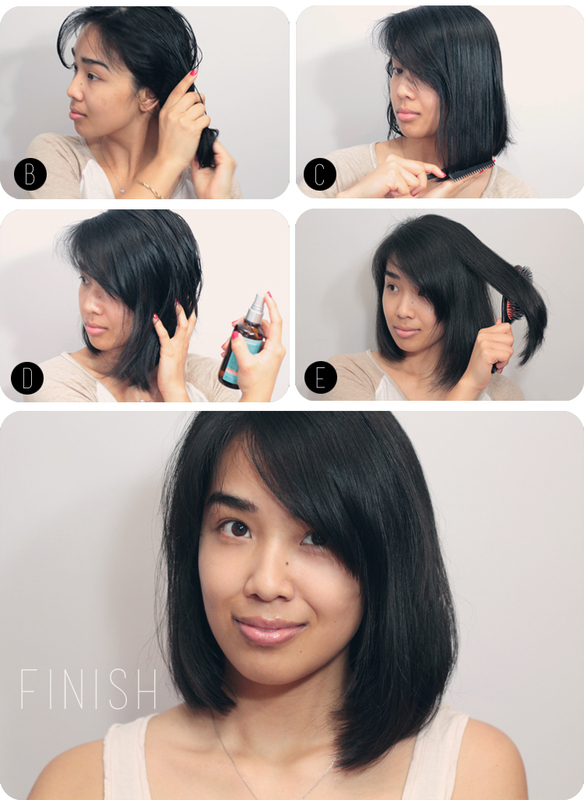 While my hair is still damp, I apply a pump of Redken Anti-Snap to my hair (from the roots to the tip). Then I apply some Phytodéfrisant and some Living Proof hair primer, focusing on the ends. I use a comb to evenly distribute the products while smoothing out my hair. Then I spritz some of the Moroccanoil finishing spray to my hair and let it air dry. If I'm feeling frisky, I'll put more of an effort to style my hair by blow drying or curling it. However, I like the disheveled look, so most of the time, I just let it air dry while I eat my breakfast. My very last step is to brush my hair out a few times before I head out the door. great post! 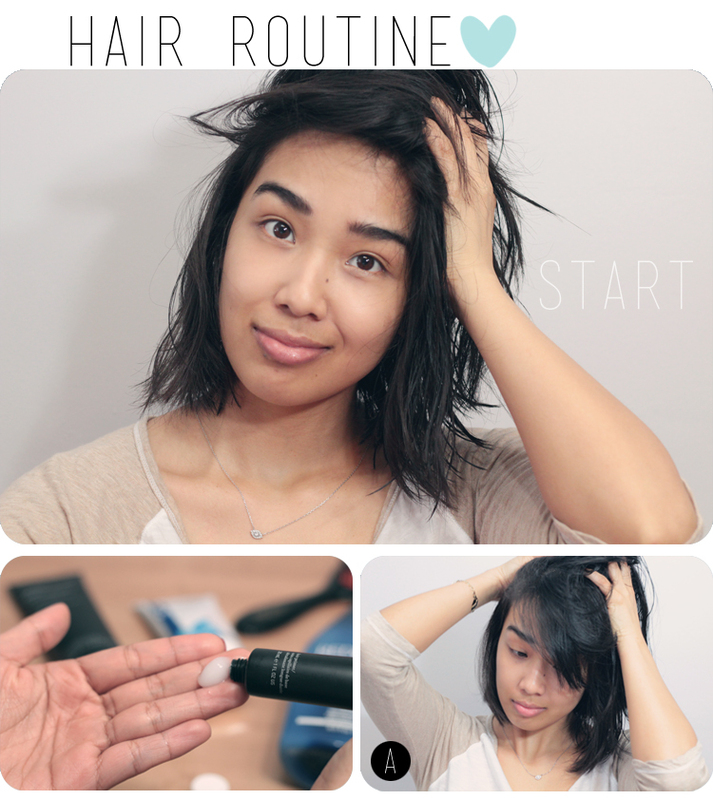 I've heard amazing reviews on the hair primer, I need to give it a try :) I also really want to try the MoroccanOil spray, I love that brand in general! Your short hair is gorgeous! Awesome blog post. I also love using Coconut Oil, I also use a liquid version on dry hair as a smoothing serum, it's really great stuff. I also find I can get a similar effect from Olive Oil if I don't have anything else.